NEWARK, Del. 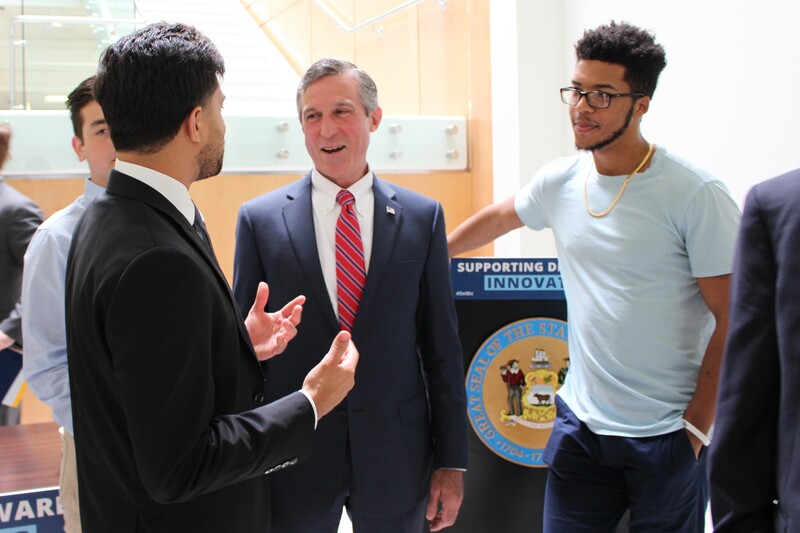 – Governor John Carney on Thursday signed into law House Bill 170, the Angel Investor Job Creation and Innovation Act, at the Delaware Technology Park at the University of Delaware’s STAR Campus. The Angel Investor Job Creation and Innovation Act establishes a refundable tax credit for qualified investors in Delaware small businesses to spur job creation and innovation. The law establishes guidelines for awarding a tax credit worth up to 25 percent of the investment in a qualified, Delaware-based small business. Businesses receiving the investment must pay decent wages, employ fewer than 25 employees, and engage in innovation in one of several areas as its primary business activity. Governor Carney called for passage of the Angel Investor Job Creation and Innovation Act in his 2018 State of the State Address. The bipartisan legislation was sponsored by Representative Michael Ramone, Representative Bryon Short, Representative Melanie George Smith, and Representative Dave Wilson. Senate sponsors included Senate President Pro Tem David McBride and Senator Cathy Cloutier. “As a longtime advocate and mentor of early stage technology-based businesses, the Angel Investor Tax Credit should be a stimulus for new investors to support entrepreneurs in Delaware,” said Michael Bowman, Associate Director of the University of Delaware’s Office of Economic Innovation and Partnerships, and President of the Delaware Technology Park. The Angel Investor Job Creation and Innovation Act establishes guidelines for awarding a tax credit worth up to 25 percent of the investment in a qualified, Delaware-based small business. Businesses receiving the investment must pay decent wages, employ fewer than 25 employees, and engage in innovation in one of several areas as its primary business activity. By statute, the Delaware Division of Small Business will have until November 1, 2018 to create and publish an application for small businesses looking to participate in the program in calendar year 2019. Using proprietary technology to add value to a product, process, or service in a qualified high-technology field. Researching or developing a proprietary product, process, or service in a qualified high-technology field. Researching, developing, or producing a proprietary product, process, or service in the fields of agriculture, manufacturing, wildlife preservation, environmental science, financial technology, or transportation. Researching, developing, or producing a new proprietary technology for use in the fields of agriculture, manufacturing, financial technology, or transportation.